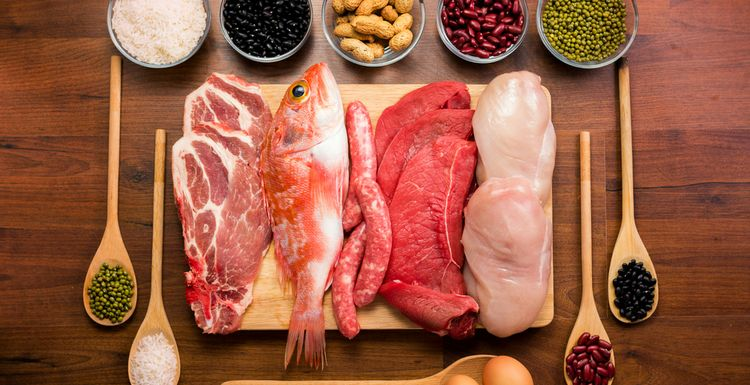 We all need protein as part of our everyday diet, although requirements are greater for those in heavy training. The old standby of lean steak is the body-builders friend for a reason. It has over 30% protein by weight. It does take a while to digest, so best eaten after the workout rather than before. Good lean mince will also pack a protein punch, and is friendlier on the wallet. Cook it up in a chilli or Bolognese, and get even more vitamins from all those tomatoes and onions. Chicken breast is another gym-goers favourite. Try it Persian style or even low-carb Greek style. It is worth avoiding the super-low-price chicken breasts as they tend to be plumped up with water. Tuna is now readily available as steaks, which makes a nice change from the tinned stuff. It has about the same amount of protein by weight as beef steak, but is lower in saturated fat. Like all oily fish, keep your intake to around four portions a week due to pollutants. White fish and seafood also provide plenty of protein, and there are no upper limits on consumption for these. Beans, pulses and soy are excellent sources of protein for vegetarians. If you eat eggs and dairy, these are also good sources. Milk and cheese also contain calcium for your bones and a raft of other vitamins. A simple egg on toast breakfast should keep you fuelled right through to lunch. Quick veggie snacks are also an excellent way to get your protein top up. Sometimes we just have to cheat. Protein bars and protein shakes have their place when time is pressing and you need your protein fix. As always, check labels to make sure that you aren’t eating solid sugar dressed up as health food. Protein fills you up, builds muscle and so helps you deal with fat. What’s not to like? that's interesting about the limit on tuna - I looked it up, unfortunately the pollutant is mercury and it seems to be worldwide. Glad to know it isnt totally off limits.